Keep Your Baby Safe and Your Mind At Peace with the Best Furniture and Corner Guards Set by Komfortology! Are you worried about your little one bumping into sharp table corners and furniture edges around the house? Would you like to protect your inquisitive baby, without compromising your home décor? Then this premium quality baby safety set by Komfortology is for you! A must have item for any home with small children, this furniture edge and corner guard set will help you relax, knowing that your baby is safe at all times. 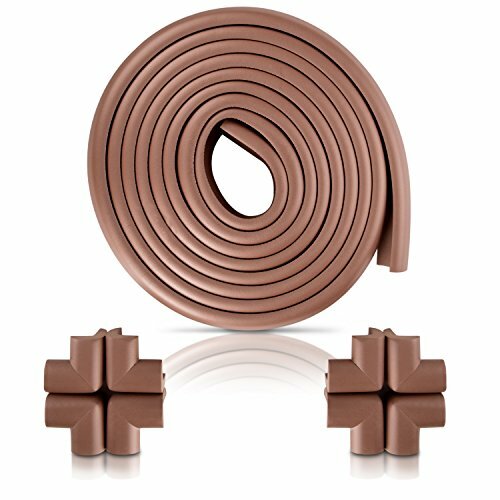 This baby proofing set comes with 18ft of soft, dense and extra durable rubber foam cushion in black color that you can easily cut to fit on all your furniture and 8 matching, corner guards for faster installation. Designed to cover maximum edge area, these corner guards feature extra strong, 3M adhesive tape and can be applied directly on your tables/desks, without requiring any tools (Instruction manual included). Blends In with Your Furniture for a Discreet Result, Without Compromising Your Home Décor! Easy to remove, without leaving any glue residue on your furniture, the corner bumpers are dense and soft to the touch with an even color tone that blends in with your home furniture for a discreet result. Our top priority is your child’s safety, which is why have designed this baby proofing set to be 100% non toxic and free from dangerous BPA, Phthalates and flame retardants. Backed by a risk-free, 30 day money back guarantee, you have nothing to lose! Order Your Child Proofing Set Today! ✔ POPULAR CHILD PROOF SOLUTION FOR YOUR HOME: Transform your sharp dangerous corners and edges into soft impact absorbing surfaces within minutes. Keep your Baby safe and your mind at peace with longest furniture Edge and Corner guards set by Komfortology®! Comes with FREE E-Book! ✔ DAYCARE RECOMMENDED PREMIUM QUALITY PRODUCT: Strong, 3M adhesive, Furniture-safe TAPE | Stylish non toxic rubber foam that doesn’t take away the natural beauty of your fixture. Soft, dense and durable. ✔ INSTALL EASILY, FITS ANY FURNITURE: Simply cut with scissors to fit your furniture. Apply in seconds. No tools required. ✔ LOVE IT OR YOUR MONEY BACK: Backed by a 30 day money back guarantee, you have nothing to lose! It’s a hit!!! This edge and corner guard bundle is very thick and provides an amazing cushion to sharp furniture edges. Very Good I was a bit skeptical to buy it after seeing some of the the reviews that it doesn’t stick. But, I am pleasantly surprised that it is sticking well on my wooden chairs. The color also blends well that it doesn’t get unnecessarily noticed and has a quality feel. It is thick enough that you cannot feel the chair edge, sufficiently soft as well.